On the this page you will find all of the event information. Please check here before contacting us – due to the large number of e-mails received daily, we cannot respond where the answer is included here. You will also be emailed a Runners Information pack during the 10 days before race day. If there are any problems with on-line entry contact FRSystems which provides the entry system. If you received confirmation of entry by e-mail then your entry is secure. 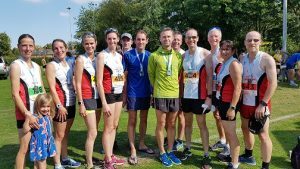 Fleet Half Marathon organisers Fleet & Crookham AC cannot answer questions about the on-line entry system. Only military entries (and other Race Director approved entries) are accepted by post. All other runners should use the on-line entries facility. Entries are accepted up to 17 February 2019 or when the entry limit has been reached. There are no late entries or entries on the day. Note – in previous years the civilian entries are normally full by early New Year – please enter early. We do not operate a waiting list. Has my entry been accepted? Yes, if you have entered on-line and have received a confirmation email from FR Systems then your entry is secure. If you are a military entry you will receive a confirmation of entry once your bank credit or cheque has been cleared and your entry passed to FR Systems. Note that it does take some time to process the military entries which can lead to a delay in names showing on the start list. Questions relating to Army or other armed forces entries should be directed to the Army Athletic Association Web site https://athletics.armysportcontrolboard.com/ or your relevant Service contact. All Army and armed forces entries must be made on the official entry form on https://athletics.armysportcontrolboard.com/ . Please do not enter on-line through the civilian route. The Fleet Half Marathon supports Bloodwise (formally known as Leukaemia & Lymphoma Research) and Hampshire and Isle of Wight Air Ambulance. For more information about these charities and how to raise funds for them visit our partners page. However, you are free to represent another charity should you wish to. There are absolutely no late entries or entries on the day. I am injured or otherwise unable to run. Can I have a refund? Once your race entry is accepted we are unable to make refunds. Up to 28/02/19 numbers can be transferred to a substitute runner online by the person who made the original booking via their account with FR Systems (see original email from your entry acceptance). An affiliated runner’s place may only be transferred to another affiliated runner. UKA affiliation will be verified during the online entry process. Numbers are sent out from 01/03/19. From 01/03/19 to 12/03/19 online number transfers can be made but the runner number will not be re-issued and it is the responsibility of the original runner to update the online entry held by FR Systems (see original email from entry acceptance) and pass their race number to the new runner. Note: the number will show the name of the original runner – no new number will be issued – you can cover the original name if you wish to. Once numbers are issued they cannot be swapped between sexes as female numbers begin with an F.
Unauthorised number swaps may result in disqualification. Yes – see paragraph above. If you transfer your number to another runner without the event being advised this is against UK Athletics regulations. UK Athletics states: Rule 216 Entries(3) ‘Numbers are issued to the individual athlete completing the application form and are non-transferable except with the specific authority of the Race Secretary’. This is particularly relevant in a medical emergency where the person running is not that shown on the race listing. If you change your address please contact our entry administrators FR Systems at info@FRSystems.co.uk so that your race pack is sent to your new address. Also ensure that you have Royal Mail Redirection set up. You can amend your entry up to midnight on the 28th February 2019. After this date race packs will be sent to the original address on the entry if it has not been amended. Race packs will be sent out after 2nd March 2019. Please do not contact us if you have not received your race pack by race day. Instead, if you have a confirmed entry either on-line or postal (on on-line listing, e-mail confirmation or cheque cashed), and have received the Runners Information pack via email contact the Race HQ in the Runners’ Tent on race day – your place is secure and your number will be re-issued on race day. Pre-ordered T-shirts are being sent out with the race packs. Please note that race packs for military entries will not be sent out and must be collected from the Runners’ Tent on the day. Please arrive to collect numbers between 8.30am and 9.45am (latest). Your Runners Information Pack will be emailed to you in advance of the day. Please check that your running number has a ChampionChip timing device fixed to the back of it. If this is not the case, please visit the Race HQ (in the Runners Tent) in Calthorpe Park on race day. Do not contact us in advance. Do not remove the chip or fold your number in a way which may damage the chip or your finish time will not be recorded. These will be sent out with your race number from 2nd March 2019. Military entrants can collect one on the day. My number has not arrived. What do I do? First check that your entry has been accepted by checking the list of runners. Otherwise, if the race pack does not arrive by the race day, you can pick up a replacement number on the day from Race HQ. You do not need to contact us in advance. See ‘when will I receive my race number’ section above. Full details of how to reach the event are included in the Runners’ Information Pack which will be emailed to you. The main event starts at 10.30am. The use of personal stereos, iPods, phones or other music devises is not allowed under UKA rule 240 S5 – the wearing of headphones, or similar devices, (other than those medically prescribed), is not permitted in races on any single carriageway road that is not wholly closed to traffic. There are some short sections on the Fleet Half course which do have traffic coming in the opposite direction to runners and is therefore not wholly closed. The wearing of such equipment may prevent you from hearing instructions from marshals and other event staff as well as the hearing of sirens/horns from emergency services and other vehicles. By wearing such devices you are putting yourself and those around you at risk. Rule 240 S5 also states if the athlete wears conductive headphones, these are acceptable as these work by conducting sound through bones and do not sit or block the ears. The event will have no responsibility should this rule be ignored. Please do not risk our ability to get a future license for this event by ignoring this rule. Park in the town centre car parks only. There is no parking available in Calthorpe Park. Do not park in the roads around the park. Not only does this inconvenience local residents but parked cars may also obstruct the race and your vehicle may get damaged. The town centre car parks are just a short walk from the race start and finish. Car parking charges must be paid. Calthorpe Park is a short walk from the town centre car parks. Turn up the Fleet Road and then right at the crossroads with the Oatsheaf pub on the corner. Calthorpe Park is on the left-hand side further down Reading Road North. There is an access route across the cricket field as well as the main park entrance as well as an entrance at the back of the park in Merivale and via the driveway from Fleet Town FC. The race will start promptly at 10.30am. There is a short walk from Calthorpe Park to the start so ensure that you arrive in plenty of time. Please listen to PA announcements and allow plenty of time for the walk to the start. The start will not be delayed for late arrival of runners. Line up close to your estimated finish time board – this allows faster runners to be at the front. The Race HQ on the day is in the Runners’ Tent. The route is the same as that used in 2018. Please be aware that there is one sleeping policemen on the final run in to Calthorpe Park. There are also some wide sleeping Policemen on Fleet Road which you cross twice on the loop of the town at the start of the race. There are 5 water stations on the route. Water pouches are available at water stations 3 and 5 – the other 3 stations all have cups. For the 2019 event we will have pace makers to guide you to the following finish times – 1:30, 1:45, 2:00 and 2:15. They will be clearly visible wearing a back pack with a flag showing their pace time. There will be 2 pace makers running together for each time band. As stated in the race entry terms and conditions, there is a three-hour time limit for the race. This event has a strict 3 hour time limit due to the use of the public road and the imposed limit on the road closure duration. If you are falling behind this time limit, you will be allowed to carry on but will be asked to use the pavement as we are obliged to re-open the roads according to the approved road closure agreement. When running take sufficient water on board at each drink station – do not wait until you feel thirsty. If you carry your own sports drink or gels, please dispose of them at the water stations. The Fleet Half Marathon works with The Event Medicine Company under the guidance of our Medical Director Dr Brian Robertson. They are also assisted by St Johns Ambulance. We exceed the Level 3 cover as defined by UK Athletics. Results will be published in the finish area as soon as possible after the runners finish. They will also be available on www.fleethalfmarathon.com/results. Your finish time can be texted to you if provide your mobile number on your entry. Remember there may still be road closures in force when you leave after your run so please plan your route.